This year’s Content Marketing Conference promises to be the best ever. But while you’re here, why not spend a few hours or a few days seeing and experiencing what the city has to offer? Boston is our home at WriterAccess and the CMC, which means we have plenty of suggestions for making your Boston trip memorable. Here are our top recommendations for things to do while in Boston and the surrounding areas. It’s hard to talk about American history without mentioning Boston. (We’re sure you can try, but it’d be wildly inaccurate.) The Freedom Trail is 2.5 miles which crosses 16 historic sites that you simply can’t miss. The tour includes such sites as the Boston Common, the Boston Massacre Site, the Old North Church, the Paul Revere House, the USS Constitution, the Bunker Hill Monument, and Faneuil Hall. You can walk the Freedom Trail yourself, or go with the Freedom Trail guides who give tours between 10:30 am to 3:00 pm at different times, depending on the tour. Plan at least a half day. You can find out more about the Freedom Trail on their website and purchase tickets. Without a doubt, the Boston Museum of Fine Arts is one of the premier museums in the country with its Egyptian treasures, its Impressionist paintings, and artwork from Ancient Greece. It has an vast array of Persian, Asian, and ancient Middle-Eastern art as well as a newer wing which contains American art from pre-Columbian to Modern. You’ll be amazed at the artwork this museum has on display and you’ll find it fascinating for both the historical and artistic values. Plan on spending at least a half day to a full day here to thoroughly enough what the museum has to offer. 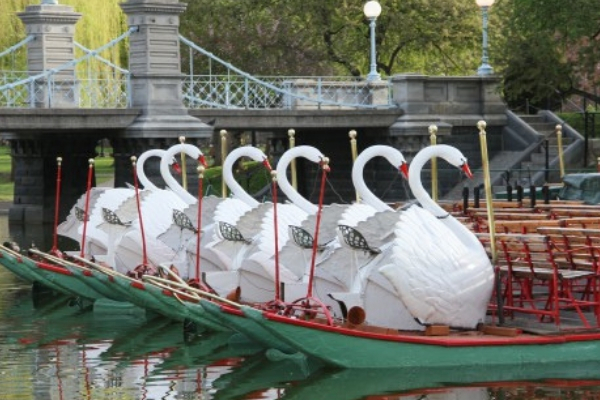 If you’re around Boston Commons, you can’t miss scheduling a ride on the historic Swan Boats. They rides reopen April 13th for the season and the spring hours are 10:00 am to 4:00 pm. Established in 1877, the Swan Boats are designated a Boston Landmark. The ride, itself, lasts around 15 minutes, meaning you can enjoy the sights the tour on the lagoon and still have plenty of time to do other things in your day. The boats use bicycle pedals and gears to operate the paddles that propel the Swan Boat. The guide uses his or her legs to power your boat around the the lagoon. Bring your camera and maybe a light jacket. There’s nothing quite as awe inspiring as see majestic whales, dolphins, and other sea mammals in their native habitat. Take a cruise to the Stellwagen Bank National Marine Sanctuary from Boston and be amazed by these extraordinary creatures. You’re likely to see many species of whales including humpback whales on this excursion. Cruises run from half day to full day, depending on the type of cruise and boats used. Be sure to bring a camera and binoculars as well as bottled water, jacket, sunscreen, and sunglasses. Depending on whom you book with, they may have refreshments available. Harvard University is the oldest university in the United States, founded in 1636. Harvard Square, Harvard Yard, and the Harvard Museums are open to the public and you can get a free walking tour of the campus if you go to the Harvard Information Center who will pair you up with a student who will share their knowledge about Harvard, its history, and its lore. Grab some ice cream in Harvard Yard and then visit the many campus museums. Among the natural history museums include the Peabody Museum of Archeology and Ethnology, the Museum of Comparative Zoology, the Mineralogical Museum, and the Botanical Museum. You can see the wildly popular glass flowers, the mastadon and other fossils, and the treasures brought back from the Lewis and Clark expedition. Harvard’s art museums include Fogg Art Museum, Busch-Reisinger, and the Arthur M. Sackler Museum which have Chinese Jade and Bronzes, Italian early-Renaissance art, and Greco-Roman antiquities. Plan on spending at least a day there. The 2019 Content Marketing Conference is going to be the best ever! Haven’t gotten your tickets yet? Save hundreds and preregister now. Maggie B is a professional, multiple award-winning writer and editor of more than 30 books and more than a thousand articles. She earned her Master’s Degree in Liberal Studies with an emphasis in creative writing at the University of Denver. 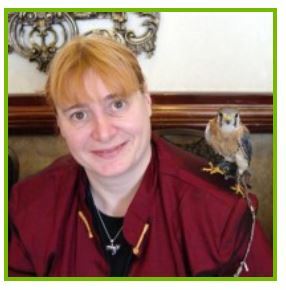 She has written articles on science, pets, sustainability, hunting, technology, outdoors and recreation, food, writing, publishing, careers, and other topics. She is the publisher for Sky Warrior Books and Garnet Mountain Press.